It’s a running joke within the type 1 diabetes community that the cure is only ever five years away. It stems from the sensationalising by tabloid media of admittedly exciting R&D breakthroughs, and has become something we cynically say whenever the ‘Next Big Thing’ in diabetes research is reported. I have had type 1 diabetes for the last 15 years, and have become accustomed to the fact I may well be taking care of this disease for the rest of my life. I want to open up about what it’s like to walk this daily tightrope, the effect that can have on mental health, and the amazing work being done to make life with diabetes just a little easier. Did you eat too much sugar as a kid? To be clear, I am only talking about type 1 diabetes, the autoimmune disease that results in the destruction of insulin-producing cells in the pancreas. Patients with type 1 diabetes require insulin replacement therapy, which has historically consisted of insulin delivery by injection into fat under the skin, although inhaled insulin is now on the market. Patients with type 2 diabetes still produce some insulin, but lack sensitivity in cells to absorb it. Treatment for this generally revolves around drug therapies to increase insulin. While the two diseases share many similarities in symptoms (and complications), they are fundamentally different. Insulin is a peptide hormone secreted in pancreatic beta cells that controls the level of glucose in the blood, signalling the liver to remove and store it as glycogen. It was discovered in the 1920s by two scientists who later shared a Nobel Prize for their work, Banting and Best. At the time, the life expectancy of someone diagnosed with ‘Sugar disease’ had a life expectancy of 1 year, and the ‘treatment’ was a starvation diet until you withered away. Elizabeth Hughes Gossett, the first American to get treated with insulin at 15 years old in 1921, lived to the age of 73. I think that is really quite remarkable. Nowadays, people with type 1 diabetes can live fulfilling, rewarding lives whether they’re leading governments (Theresa May), playing international football (José Iglesias), sitting on the US supreme court (Sonya Sotomayer) or being heartthrobs (Nick Jonas). One thing people with diabetes can’t ever do however, is forget that they have diabetes. As I wrote above, insulin signals the liver to remove sugar from the blood and store it as glycogen, but we also need some sugar in the blood to fuel our brains (4-7 mmol of sugar per litre to be precise). If glucose levels dip below this (hypoglycaemia), it leads to agitation, shakiness and confusion. To the untrained eye, this can often resemble drunkenness. If levels dip too low, unconsciousness and eventually death can occur. On the other hand, high glucose levels (hyperglycaemia) result in short term fatigue, thirst and increased urination. Fine, I can handle a bit of fatigue, but the bigger problem is that chronic hyperglycaemia leads to more severe long-term effects. Over time, nerve damage (neuropathy) all over the body can occur, resulting in complications including blindness and debilitating pain. My latest 90 days of continuous glucose monitoring data, demonstrating the challenge of maintaining balance between 4-10 mmol/L. Dashed line represents average blood glucose. Report produced with Medtronic CareLinkTM. 6 A.M. You wake to the sound of your continuous glucose monitoring (CGM) alarm, your blood sugar is at 10.4. The ‘dawn phenomenon’ – the blood sugar rise as a result of morning cortisol release – is worse than normal. You take a corrective dose of 2 units of insulin (UI) and go back to bed. You wake again at 7.30 to the sound of the radio alarm this time, blood sugar at 5.6, great! You calibrate your CGM with a finger stick blood test and prepare breakfast, 2 slices of toast (35 g carbs), peanut butter and jam (5 g). Taking into account your morning insulin ratio of 10:1, you figure you need an even 4 UI. You’re feeling very nervous about the presentation you have at work this morning, and as you cycle to the office, your blood sugar starts rising, 8, 9, 10 (ALARM), 11, 12. You get to work and take a corrective dose of 3 UI. You have an hour to prepare for your presentation and your blood sugar isn’t moving anywhere, sticking resolutely at 12. You take another 2 UI for good measure and deliver your presentation. By lunch, your blood sugar is sitting happy at 6. You grab a sandwich (35 g) and a banana (9 g) and give yourself 3 UI (insulin ratio 15:1). By 14:00, you’re feeling dodgy and the article you’re reviewing is losing all meaning. Your CGM alarm goes off, 3.2! You don’t know why you’re hypo but that doesn’t really matter, best just to fix it with some glucose tablets. Whoops! You over-treated, now you’re at 8, you take 0.7 UI to bring you back down a little. After cycling home from work, your boyfriend surprises you by taking you out to a restaurant to celebrate your presentation, how sweet! By the time you walk there and are seated it’s 19:00 and your blood sugar is at 4 and heading downwards. You have done quite a bit of exercise this afternoon and haven’t eaten much, do you eat sugar now, and risk over-treating, or wait for your food? You decide to wait, your blood sugar dips to 3.5. You’re feeling quite rubbish and are getting agitated by your boyfriend’s concern, you wish he would be quiet and let you concentrate on not feeling like the world is melting. Finally, the food arrives, you ordered the salmon and potatoes in teriyaki sauce (?? g) with a glass of wine (?? g). You take an educated guess on carbohydrate content, take 6 UI, and enjoy the rest of your evening. At 21.30, you’re back home and your alarm goes off, blood sugar at 10 with two ominous upwards arrows. That teriyaki sauce was sugarier than you thought. You take 3 more UI and hope for the best. You would like to stay up and make sure your blood sugar returns to normal, but you have an early start tomorrow and need to get to bed. At 22:00 you hit the hay with a blood sugar of 11.6, after calibrating your CGM with another finger stick test of course. 2:15 and your boyfriend shakes your shoulder, you drowsily come around to the sound of your CGM alarm, 2.8 it reads. Annoyed and with an unquenchable hunger, you stumble to the fridge and eat everything you can find, ready to ride the blood sugar roller coaster another day. This isn’t some out-there hypothetical, but a fairly normal day for many diabetics. Unfortunately, life isn’t routine, and if patients living with type 1 diabetes want to live full lives, they have to be ready to adapt to the everyday things that life throws at them. Aside from about an hour a year where patients meet with specialist nurses or endocrinologists, the burden of diabetes management is solely on the patient. This, along with the self-consciousness arising from injecting yourself, the guilt of not feeling like you’re doing a good enough job, and the worry of long-term complications down the road, can take a severe mental toll. Almost all diabetics at some point in their lives will experience ‘diabetic burnout’. This vaguely defined term is generally agreed to mean when patients, as a result of mental strain, lapse in their vigorous treatment regime through reducing testing, skipping insulin doses, or not calculating carbohydrate intake accurately. Any lapse in treatment can result in a dangerous rise in average blood sugar. Diabetes UK has its own definition of burnout here. These burnout periods can last for years without proper intervention. Diabetics are also two to three times more likely to suffer from other mental health issues including major depression, anxiety and eating disorders [1-3]. Type 1 diabetes also enables a horrifying eating disorder not seen in the general population. Through insulin starvation – drastically reducing insulin doses – cells in the body cannot take up sugar for fuel. Instead the body burns through fat and protein, leading to drastic, unhealthy weight loss and skyrocketing blood sugar levels. Diabulimia as it’s known, has been found to be prevalent in 14-36 % of people with diabetes . Walking the diabetes tightrope is not a fun activity. These are worrying statistics to read, so what can be done to keep people with type 1 diabetes sane in this jungle of needles and testing strips? One big thing to focus on is to lower the burden of decision-making on patients by letting computers take over the work. Great strides are being taken with insulin pump technology to achieve what is known as ‘closing the loop’. 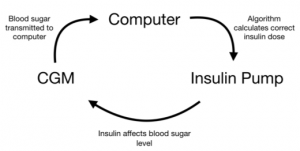 A closed-loop system is one in which insulin pumps are allowed to either give more insulin, or suspend insulin delivery, based on data from continuous glucose monitoring (CGM) systems. This effectively acts as an external pancreas, producing a feedback loop between insulin and glucose levels. However, getting such an autonomous device to market is a regulatory minefield. The first closed-loop insulin pump to be approved by the US FDA is the Medtronic MiniMed™ 670G, released in spring 2018. This pump attempts to maintain glucose levels at a target concentration by varying the level of background insulin. However, the system still requires a lot of human input, with frequent blood glucose calibration through finger-stick tests. Furthermore, in order to comply with regulators, the target blood sugar can be set no lower than 6 mmol/L, a number some in the community feel is too high*. Taking things a step further, a group of pioneering patients have developed their own DIY artificial pancreas systems under the banner #WeAreNotWaiting. OpenAPS and Loop are two of the groups working on a DIY closed-loop solution. Their systems revolve around reverse engineering an older insulin pump and pairing it with a CGM device and a rig made up of a small computer (like a Raspberry Pi), a radio board and a battery. The CGM device feeds glucose concentrations to the computer, which can then relay insulin dosing actions to the pump based on open source algorithms. These systems are not approved for medical use by any regulatory boards, but they are also not for sale, so are not subject to the same legal requirements. Any person with diabetes, so long as they do not fear the dreaded Linux terminal, can build one of these rigs for themselves and design a customisable treatment regime. Initial research on these systems shows promising reductions in average blood sugar and time spent in hypoglycaemia [5-6]. Crucially, closed-loop systems perform hundreds of micro-dosing decisions a day, decisions that are directly taken out of the hands of the patient. Embracing AI to reduce patient decision-making will reduce the burden of care on patients and may lead to lower overall blood sugars, reducing healthcare costs associated with treating diabetes complications. There is something else you can do today to improve the mental well-being of those around you with diabetes. Don’t police what we eat, any cake is possible with the right insulin dose. And yes, I’m certain that the new fad cinnamon diet you read about is not going to be the cure. Writing this blog has got me excited about DIY diabetes solutions, and I have decided to build my own pancreas! Follow my progress by adding me on twitter @RobatNotch. *For reference, I monitored my non-diabetic boyfriend’s blood sugar over a week, and even after gorging on an entire 200 g bag of candy (for science! ), his blood sugar barely went over 6 mmol/L, before swiftly falling back down to below 5 mmol/L.